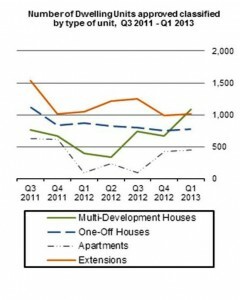 The CSO statistics for Q1 2013 show a positive trend in terms of applications being approved for multi-development dwellings with a notable increase from Q4 in 2012. The rate of approvals for multi-development dwellings had marginally decreased in the latter quarter of 2012 having previously shown a strong increase. Whilst this growth is starting from a low level it will be interesting to see if the growth continues. 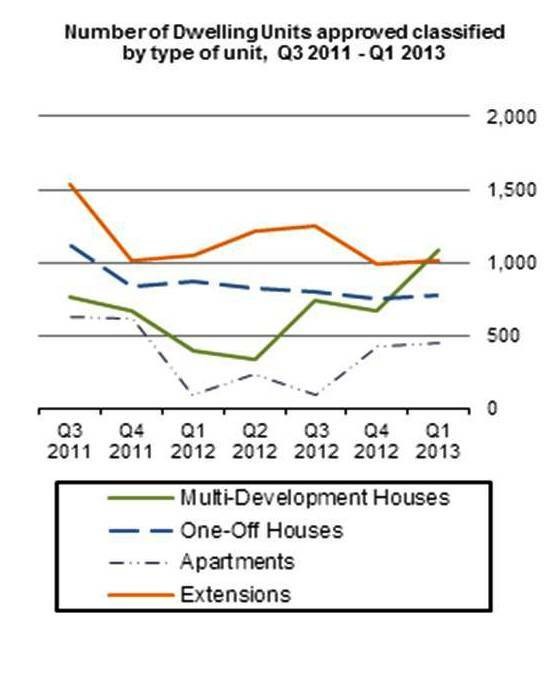 Over all the number of all types of residential units was up by 24.7% in Q1 2013 relative to Q4 2012. Unfortunately the level of detail in relation to commercial planning approvals is notably lacking.